WASHINGTON (April 19, 2017) — The National Transportation Safety Board, in collaboration with Stopdistractions.org, DRIVE SMART Virginia and the National Safety Council, will host its second roundtable on distracted driving to facilitate discussion about the life-threatening problem and specific solutions for eliminating distracted driving on our highways. More than 15 survivor advocates of distracted-driving crashes are scheduled to join law enforcement officers, insurance industry representatives, safety advocates, and lawmakers April 26, 2017, at the “Act to End Distracted Driving” roundtable, an event designed to improve public awareness about the deadly problem and establish better coordination among state and local governments, employer fleets, and law enforcement. NTSB Acting Chairman Robert Sumwalt will moderate the participant-driven discussion. 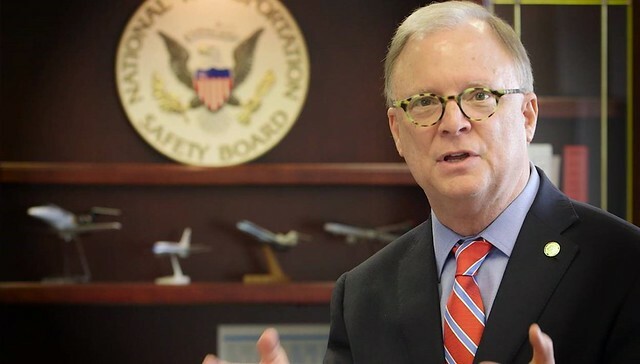 In this screen shot taken from the NTSB video “Act to End Distracted Driving” Acting Chairman Robert Sumwalt is shown discussing the importance of eliminating distracted driving. Click on the photo to view the full video or visit https://youtu.be/GwWiQrOGvDc. Nearly 10 percent of traffic deaths involve distracted drivers. That’s about 4,000 deaths that are completely preventable, that never have to happen. The roundtable discussion highlights victims’ stories in an effort to address the specific steps and actions needed to prevent such tragic crashes. The one-day roundtable event is scheduled to begin at 9a.m., in the NTSB Board Room and Conference Center. A video featuring Acting Chairman Sumwalt discussing distracted driving is available on the NTSB YouTube Channel at https://youtu.be/GwWiQrOGvDc. The final agenda for the roundtable is available online at https://go.usa.gov/x5aC9. The event is also scheduled to be webcast live. A link to the webcast will be available on the day of the roundtable at http://ntsb.capitolconnection.org/. An archive of the webcast will be available on the NTSB website after the event. The Twitter hashtag for this event is #Act2EndDD.